Episode 8: "Charlie's Highland Fling"
Charlie Chan and Number One Son, Barry, are visiting Gregg castle in Scotland. Mr. Wingate, the Gregg family lawyer who is in charge of the family's business affairs, fills Chan in on Sir Malcolm Gregg's marital problems, having nothing but very negative things to state about Lady Gregg, who is scheduled to arrive at the castle that day. Wingate adds that Sir Malcolm's son, Donald, who will also be coming that day, is despised by Lady Gregg. Meanwhile, Donald meets with his fiancé, Betsy, whom he tells in no uncertain terms that, try as she might, his step-mother will never cause the couple to separate. Back at the castle, Inspector Forsyth informs Sir Malcolm, Chan, and Wingate that Lady Gregg has been found murdered, having been shot on a country road. Arriving at the family castle, Donald is informed of his step-mother's murder. Runnals, the butler, brings in a rifle he has found in Donald's car, a find that is noted by all present. However, Chan tells Barry that the real killer would certainly have disposed of the murder weapon. Wingate admits to Chan that there are factors in both his and Sir Malcolm's lives that could be considered viable motives in the murder of lady gregg. On top of this, Lady Gregg had recently had Betsy's father, Donald, jailed for poaching on the Gregg's property. Runnals then informs Chan and Donald that Duncan escaped from prison that very morning. Barry presents Chan with his theory that it is Wingate who is the guilty party. As he has found that Wingate has in his possession an detailed map of Glentarn County as well as travel brochures of Honduras, Barry surmises that Wingate killed Lady Gregg and now plans to escape to a location thousands of miles away. However, Chan notes, "We are also on vacation, and our home in Honolulu is many thousands of miles away." While Chan, Barry, and Donald are out in the countryside verifying Donald’s story that he had fired his rifle at a tree to test it, Duncan, Sir Malcolm’s cousin, arrives inside the castle through a hidden passageway. Wingate and Sir Malcolm, believing Duncan is innocent of the murder, suggest that he slip away to Ireland for a while in order to avoid bringing trouble to Donald and his daughter, Betsy. Chan, arriving just after Duncan's departure, finds that Duncan has made his escape through the castle's hidden passageway. Meanwhile, searching Runnal's quarters, Barry finds incriminating evidence connecting him with Lady Gregg, as well as a rifle which could be the murder weapon. 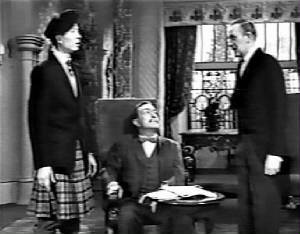 Runnals admits that he is Lady Gregg's brother, having played the part of a butler in order to escape punishment for crimes that he had committed in the past. Runnels tries to make his escape, but Chan stops him. Runnals explains that as a wanted criminal, he was innocent of the killing of his sister, Lady Gregg. As Wingate further accuses Runnals of being the killer, Chan says, to the contrary, that it is actually Wingate, himself, who murdered Lady Gregg who had discovered that the lawyer had been stealing from the Gregg family for years. As Wingate is taken away, Barry exclaims, "Didn’t I tell you he did it, Pop?" "Yes, my son," Chan answers. "You had the right suspect – but for the wrong reasons. However, very good try!" Charlie Chan (to Barry): "For Chinese New Year will buy you bagpipes." Charlie Chan (to Sir Malcolm Gregg who had offered Chan a drink): "Man can be without vice, but never without temptation - whiskey!" Charlie Chan (to Barry): "...we are also on vacation, and our home in Honolulu is many thousands of miles away." In business of crime detection, mind like umbrella - only functions when open. Hunch not important; motive, clue things that count. Not important what I think. What police think is important. Man can be without vice but never without temtation. Always have ideas - solution more difficult to come by. Always unwise for innocent to run away. When lawyer is around, watch for evidence of lawbreaking.